April 5, 2014 – Queen Elizabeth brought along a gift basket for Pope Francis when she and Prince Philip visited the Vatican on Thursday. It was the first meeting between the Pope and the Queen, who also serves as the titular head of the Church of England. 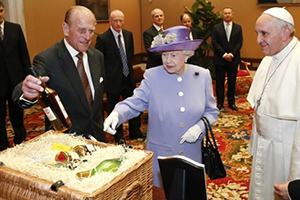 The gift basket was filled with food and products from the Royal estates, including a bottle of Balmoral single malt whisky from the Queen’s Balmoral Castle in Scotland. However, there is no distillery located on the estate, which raises the question of where the whisky actually comes from. Fear not…while the estate does not have its own distillery, it has the next best thing. The Balmoral single malt is actually produced less than a mile away at Diageo’s Royal Lochnagar Distillery in Ballater, which received a royal warrant from Queen Victoria in 1848. According to the distillery’s web site, manager John Begg invited the queen for a visit after she named Balmoral as her official holiday residence. She turned up three days later with her husband, Prince Albert, and three of their children. Lochnagar’s whisky was less than three years old at the time, since the distillery had been opened in 1845 after Begg decided to build on the south bank of the River Dee. However, it was impressive enough that Queen Victoria immediately presented Begg with a royal warrant to supply her with whisky. Begg changed the name of the distillery to Royal Lochnagar, and continued to supply whisky to the British royal family until his death in 1880. His name lives on in the John Begg line of blended Scotch whiskies. The Balmoral single malt presented to Pope Francis is a 15-year-old whisky exclusive to Balmoral Castle and available through its online shop. In fact, Royal Lochnagar does not have a 15-year-old expression in its official range.